This module can be viewed at the top of this page. This specific style of the module can only be used with this template. Publish your own content into each slide transition and for multiple slide transition effects, navigation arrows and also a drop down gallery tab that allows you to select a slide via a thumbnail. 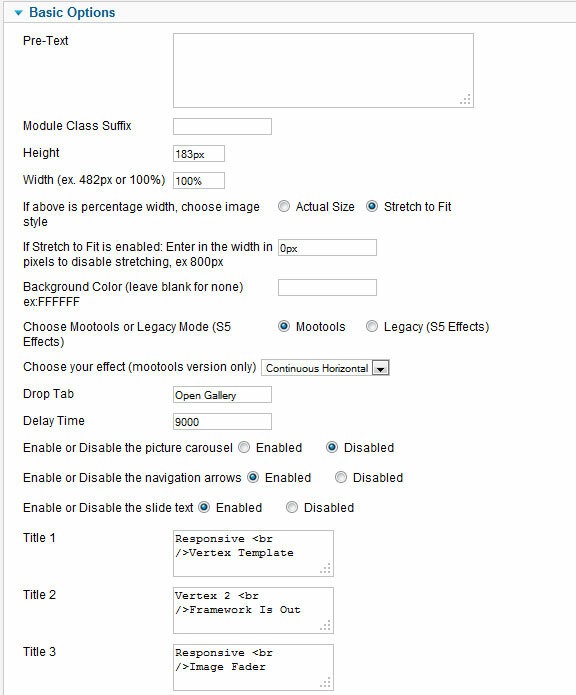 The S5 Image and Content Fader v3 is powered by Mootools by default but still includes the S5 Effects library and allows you to use it in a "legacy module" if you are experiencing script conflicts. Best of all it's free! NOTE: Legacy mode will display all your images, titles and slide text but includes limited functionality thus it does not include navigation arrows or the new drop down gallery tab. All content and images shown on this site is for demo, presentation purposes only. This site is intended to exemplify a live website and does not make any claim of any kind to the validity of non-Shape5 content, images or posts published. Stock photography was purchased from shutterstock.com for this demo only, and is not included with this template. Links will be provided for some images if you wish to purchase them from their copyright owners.